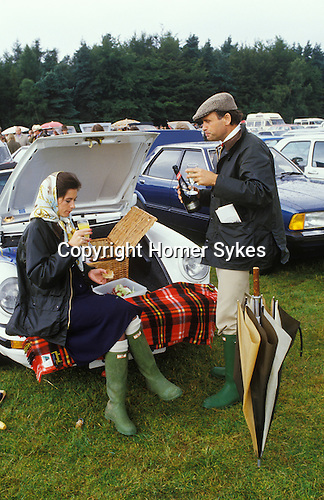 At Windsor Great Park polo ground car park a fashionable couple enjoying an alfresco picnic from their convertible Porsche 911 SC Cabriolet. They are both dressed for the occasion in new un-muddied green Hunter Wellington Boots and his and her new blue Burberry waxed jackets. Both de rigueur at the time for fashionable Sloane Rangers. She has donned a Hermes headscarf, while he is in a tweed flat cap. She's on a Bucks Fizz, but made with Henkell Trocken a German sparkling white wine, while he is taking it neat.